Waarom is het voor cannabis consumenten zo belangrijk om SP te stemmen? Twee daagse politionele actie bij veerboot. Als de SP de verkiezingen wint wordt de coffeeshop branche betrokken bij nieuw beleid. Onderzoekers reageren op kritiek tegen onderzoek naar gevolgen wietpas. Four-twenty, 4-20, or 4:20 are numbers, dates and times that are known in cannabis culture as the “insiders” codeword to smoke a joint. Originally this stems from a group of students in the U.S.A. who met daily at 4:20 PM after school to smoke a joint together. Slowly this story spread among the other marijuana smokers at that school. Ultimately the cannabis media got wind of it, and also began to use it as such. This is how 4-20, the date April 20th, and 4:20 PM became the time when many cannabis users gather in groups in parks and universities to peacefully smoke a joint. These kinds of opportunities are called “Smoke-Outs”. In spite of their genial and friendly form, all these smoke-outs have the same message: “STOP the repression and criminalization of cannabis users”. These kinds of smoke-outs are also held in places where cannabis use is prohibited, such as, among other places, many universities in the U.S.A. The police don’t usually take any action at these gatherings unless there is selling going on. Everyone brings his own joint. Why a Smoke-Out in Amsterdam, the Netherlands? - Lately here in the Netherlands, we can no longer speak of a free, liberal attitude towards cannabis, coffeeshops, and coffeeshoppers. - We, as cannabis users, are being criminalized, demonized and stigmatized by the present government and its new policies. - We, as completely legal cannabis consumers at the front door of the coffeeshop are being unjustly treated as criminals, and are now forced to register as (soft-) drug users! - We maintain that the new policy regarding cannabis and coffeeshops is based on LIES and FALSE REPORTS. - The refusal of admission to any business whatever based on country of origin or place of residence is DISCRIMINATION. - We maintain that the new policy is a policy of “harm promotion” while the permissive policy regarding marijuana was developed as a basic pillar in “harm reduction”. 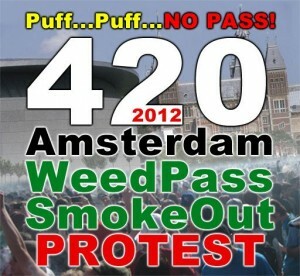 So, it’s now time for a 420 Smoke-Out in the Netherlands, too! Against the repression and criminalization of cannabis consumers! Until today, the coffeeshops offered a safe place for cannabis connoisseurs to be able to buy their weed and hash, and smoke their joint in a protected environment, free of hard drugs, and with cannabis of controlled quality. That DOESN’T mean they’ll stop using cannabis. Many will obtain their cannabis via street- or house-dealers, or grow it themselves. That DOES mean that circa 80% of the coffeeshoppers will be criminalized and will disappear into illegality where there is totally no control or oversight over quality, purity, minimum age, or the amount sold per person. Also, the chance that people will come into contact with other (hard-) drugs can’t be excluded. This, while coffeeshops don’t allow any single form of alcohol or any other hard drugs. They’re always closed immediately if these substances are found during a police check. The aim of the 420 Smoke-Out is to make it clear that we are not just a small, still group of “stoners” who hold no opinions, and can’t mount an initiative! We’re a part of the population with a standpoint that’s standing up for his- or her hard-won freedoms! The announcement of a peaceful Smoke-Out meeting in Amsterdam on 4/20 (April 20th) has received much international response. People are coming to Amsterdam from Belgium, England, France, Germany, Denmark, and from Spain and Sweden in cars, and even organized flights and buses. But there are also cannabists from Canada, America, Russia, and even Japan who are taking the trouble to come all the way to the Netherlands to show their support for the old policy, and to let their voices be heard against plans for the weed pass. Within the Netherlands, many sides have reacted very positively to the 420 Smoke-Out initiative. We’ve had reports from coffeeshops in several large areas such as Groningen and Maastricht that are mobilizing buses to bring their customers to Amsterdam. There are also exceptionally positive reactions from many very small places, even those where there are no shops at all, and many people have indicated they’ll be there on April 20th at 16:20 hours (4:20 PM). It promises to be a very enjoyable affair! Come to Amsterdam on April 20th, and find a place in one of Amsterdam’s coffeeshops to smoke a joint, and have a cup of coffee. Or eat a delicious sandwich somewhere, and shop around a little until the definite location of the meeting is made known. Make fellow coffeeshop visitors aware of the 420 Smoke-Out if they haven’t already heard about it. The more souls, the more joy, and the clearer the message is to the government! Where will the Smoke-Out be? This was the most-asked question in the last few months, and will remain so until around 1 hour before the Smoke-Out flash-mob meeting. The final location will be revealed via the website CoffeeShopNIEUWS.nl and the combined social media channels on Facebook and Twitter. So, if you’re in the center of Amsterdam around 15:00 hours (3 PM), you have enough time from the moment the location is announced (3:20 PM) to get yourself to the spot. Why the late reporting of the location? Because we want to do the Smoke-Out meeting in the form of a so-called flash-mob. With a flash-mob, the goal is to completely surprise the vicinity with a playful protest. Naturally that wouldn’t succeed if people started to assemble at the location in advance. What will happen there at 4:20 PM? Around 4:10 PM I, Peter Lunk, along with several others, will present a short introduction at the final location. Then all together, we will count down the last ten seconds before 4:20 PM. Then everyone will light up their joints. During the smoking of the joint, I will give the megaphone to anyone who wishes to speak a few words to the public and the 420 supporters. We have a series of “Vloeitje”(*) posters here that you can print out, and paste on a protest sign. But of course, we’d be delighted if good, original banners were to be seen on April 20th! The most original banner will be rewarded with a V.I.P. treatment for the whole day, the next day in Haarlem during the “Hemp City Cannalympics 2012 Kick-Off event” on Saturday, April 21st. There isn’t any dress code, but if you put something green on, it’s always good! I hope to see lots of you all on April 20th! Let’s make a fun and peaceful meeting out of it. - If you’re under 18, you’re not allowed to possess and/or use cannabis in the Netherlands. - You’re not allowed to have more than 5 grams of cannabis in total with you at any given time. - Only coffeeshops are officially allowed to sell cannabis, and selling to others outside is not permitted. If you don’t want to take any risk at all, roll a joint without any weed or hash in it, and light up your tobacco cigarette at 4:20 PM instead of a real joint! MANY THANKS FOR ALL YOUR POSITIVE EFFORTS AND HELP J.P. !! Amsterdam420 SMoke-Out 2013 04.20.2013 16:20 270 Days Click here for the Annual Amsterdam 420 Group. NL Coffeeshop & Cannabis Nieuws, Powered by Joomla!